This has technically been open for a little while though I haven’t had a chance to write up anything on the blog. I tell you, weirdness in my life has kept me from it and website glitches. I wanted it to have its own post so waited until I could do a decent one. This round the event was for The Martian Chronicles by Ray Bradbury. Very good book. The first time I read it was way way back in High School and no I am not going to tell you when that was precisely because it just… well, it’s not really all that important now is it? I had remembered bits and pieces but truly didn’t remember a lot of it. So I started reading it and realized that this time around I got a lot more out of it than I did in school. Perhaps because in school I was slightly rebelling because of the fact that I “had” to read it. Perhaps because I was less open minded then about certain genres of literature, science fiction being one I didn’t read a whole lot at the time or perhaps just a bit of that…. *says this with a wince* age changes ones perspective some. I really enjoyed the book even though there was times when I was disturbed by what I read or it gave me time to think about things in a different way. What I picked to work on…. well the masks. One thing that we as people do consistently is wear a mask. Whether it is outwardly noticeable or not. Masks to hide our feelings, to act appropriate socially, to be what people expect us to be or what we think people expect us to be. Rarely are we as people very transparent with our feelings and those who are risk more on a daily basis than most of us…. creating vulnerability. As a creative person I can understand the vulnerability aspect quite a bit. I feel it often, and as I mature I find that I am less and less willing to don the mask. To wear what people expect and to be what is expected. I am far more apt to be myself, saying or doing as I please with less regard to impressing or needing someones approval to do so. I suppose when I was young I always wore a mask, I was too afraid at what people might see if I let down my guard. I now of course have a variation of this, something different. I’m not necessarily afraid of what people might see or think of me if I let my guard down…. I have changed in the sense of, I am more particular about who will see those little bits behind the mask. Not for fear but choice. The rest well… they see what they see, and it will be what it will be all the while bubbling close to the surface when you least expect it I might throw my arms wide, laugh for no reason and give you grin because…. I felt like it. There are other instances in the book that talk about the masks. Off the top of my head…. there is one where a little girl slaps one on her face that is expressionless as a group of space traveling earth men relate to her their story. The psychologist who appears jovial because his mask has three smiles painted on the outside of it though behind it one would imagine he is not as he appears, and of course Ylla’s husband… wearing the silver mask he likes to wear when he wishes to hide his feelings from her. So as you can see something that was quite ingrained into their culture it would seem. I decided that would be what I worked on, what I presented for my own bit of thought. There could have been so many things I chose from. From space ships to golden spider toys or cooking tables with silver lava but I suppose in the grand scheme of things the masks would be what I’d choose since this sort of thing would be something I’d probably mull over on my own regardless. There are three that I worked on. Discontent, Jovial, and Neutral. 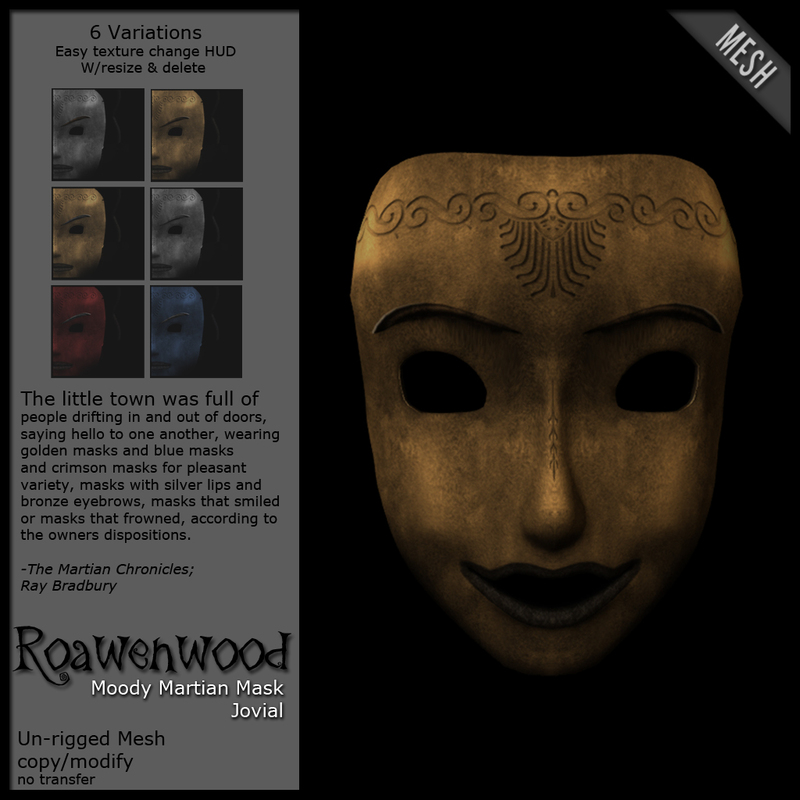 One for each mood… Unrigged mesh so it may be adjusted to fit your avatar with a few tweaks though I’ve been seeing them used as props to hold and such too which is fairly awesome. 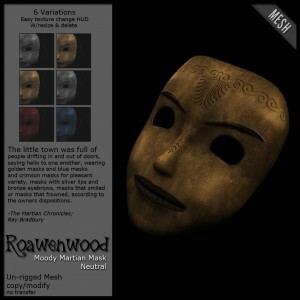 Each mask also has 6 different options as far as coloring or texture. Using a simple HUD to change the texture or to resize if you don’t like doing it yourself the scripts can be deleted to reduce scripts on your avatar if you like…. just make a back up first. For this round the event team has created a library so you can go there to pick up the items all in one place if you don’t fancy going to each main store for each creator. I know a lot of people prefer that when they go shopping. Or you can come by my main store to get it. The shopping guide for this round is up and running too so if you want to peruse the fine offerings of the other talented creators you can. I am so glad I’ve been able to be involved in this event. It is becoming a favorite, looking forward to what is coming next. The next book has been announced and I’m stoked. Cross your fingers for me that I can participate, it’s 20,000 Leagues Under the Sea! Take care and enjoy, I hope you’ve had a fabulous week.